One of the busiest stretches of the M6 is to close completely so a footbridge can be removed. Drivers are being warned about delays while Burton Bridge, between junctions 13 and 14 in Staffordshire, is taken away as part of motorway upgrades. Highways England said it "will be doing all that we can to minimise disruption in the Stafford area". Lane restrictions will start at 17:00 GMT leading to a full closure by 20:00 for up to 18 hours. The motorway will shut in both directions and traffic will be diverted on to the A449 and A34. Those travelling between the North West and the Midlands and south of England are advised to avoid the area by using the M62 and M1. 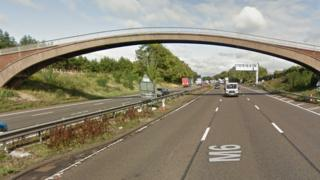 With the hard shoulder becoming a traffic lane, HGVs would no longer fit underneath the bridge, Highways England said. Highways England began upgrading the 17-mile (28km) stretch of motorway in 2017 at a cost of about £335m and is not expected to be completed until 2022. Work includes the permanent conversion of the hard shoulder to create a fourth lane, widening of Creswell Viaduct and upgrades to Dunston and Norton railway bridges. Creswell Home Farm bridge, which spanned the motorway at junctions 14 and 15, was removed in September during a 24-hour closure. Burton Bridge, which was built in the 60s, is nearly 200ft (60m) in length and weighs around 140 tonnes. It will be replaced "further down the line", Highways England said. Peter Smith, from Highways England, thanked motorists for their patience during the work which he described as a "complex process".